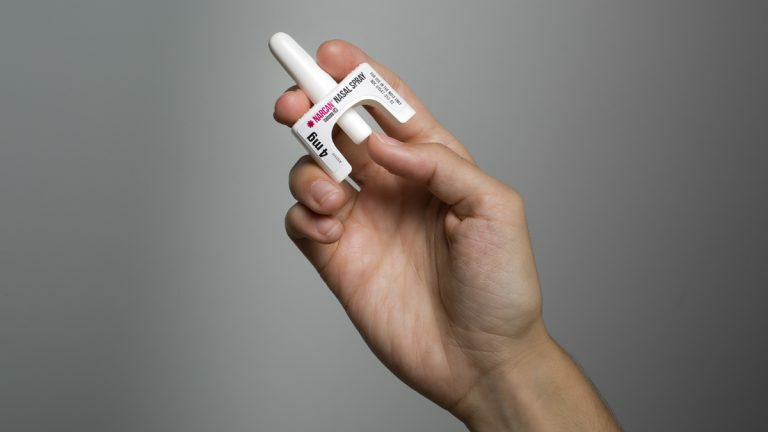 The FDA has approved the first nasal spray version of naloxone, or Narcan, the drug used to save people from opioid overdoses. Police officers and others have been using a spray form of Narcan for several years, converting the already-approved injectable drug into a mist with a kit. The Camden County Police Department, for example, has saved 159 people from overdoses with off-label spray naloxone since May of 2014. But using the atomizer requires training and assembly. The new all-in-one spray promises to be simpler. “The fact that you can just take this device and press the button and spray it rather than putting parts together seems to me to be a much easier process,” said Dave Humes, a Delaware-based activist who lost his son to an accidental heroin overdose in 2012. He carries both the injectable form and the existing nasal spray, but said he plans to get the approved spray once it is on the market. With many people wary of needles, the FDA fast-tracked the drug application to help stem the rising death toll from painkiller and heroin overdoses. Narcan can reverse an overdose within several minutes by blocking opiates from acting on receptors in the brain. Radnor-based drugmaker Adapt Pharma got the agency’s first nod after demonstrating similar efficacy to the injectable drug. “There are so many blood vessels inside the nose that it really doesn’t need to get far up into the nasal cavity,” said Tom Ferraro, a professor of biomedical sciences at Cooper Medical School of Rowan University. The trick for making a good nasal spray is concentrating the drug into a small amount of liquid, said Dan Wermeling, a professor of pharmacy at the University of Kentucky. “The nasal cavity can only hold so much liquid, or it just runs away — drips out the front, or drips down your throat — and that’s not going to permit absorption,” he said. After witnessing the devastation of opioid abuse in his state, Wermeling was inspired to develop a Narcan nasal spray of his own. The resulting product, which has since been sold to the addiction drug company Indivior, was also fast-tracked by the FDA. The application is still pending approval, with a decision expected in about a week. A green light might put competitive pressure on both companies to lower prices. Qualified first responders, including police and firefighters, will be able to buy two of the Adapt Pharma units for $75. That price point, Humes said, is about $25 below the current rate for intranasal delivery.